Elections 2016: Voting and You! Even if you choose not to register through TurboVote their Facebook page contains very interesting and current articles about voting. May 23, 2016 is the last day to register to vote in the California Presidential Primary Election. Your registration must be postmarked or submitted electronically by that date. May 31, 2016 is the last Day to Request Vote-By-Mail Ballot for the California Presidential Primary Election. 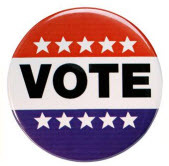 June 7, 2016 is the California Presidential Primary Election Day. Polls are open 7:00 a.m. to 8:00 p.m.
October 24, 2016 is the last day to register to vote in the November 8, 2016 General Election. Register now, if you haven't already done so, so you can vote! November 1, 2016 is the last Day to Request Vote-By-Mail Ballot for the 2016 General Election.